Football is only two weeks away! I am so excited I can hardly stand it! Fantasy football is around the corner and it’s time to reclaim the title. 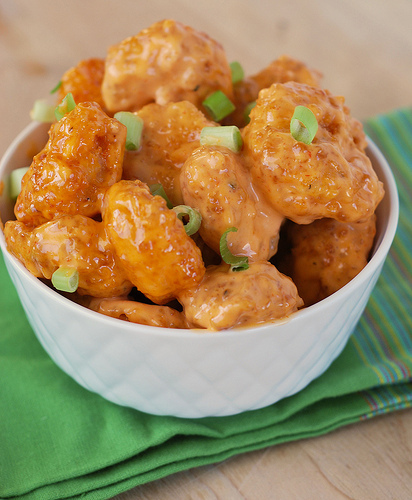 But first, it’s time to break out the football appetizers. Combine all ingredients for the sauce in a small bowl; cover and set aside. You can control the spice factor by adjusting your sriracha amount. To bread the shrimp first coat each side of the shrimp with the breading mixture. Dip breaded shrimp into the egg and milk mixture, and then back into the breading. Arrange the coated shrimp on a plate and pop them into the fridge for at least 20 minutes. This step will help the breading to stick on the shrimp when they are frying. I don’t have a deep fryer so I use a sauce pan and heat my oil to 350 degrees with the help of a candy thermometer. In a sauce pan you only want to fill with oil about half way to prevent burns from splattering. Using a deep fryer heat oil to 350 degrees. Use amount of oil required by your fryer.